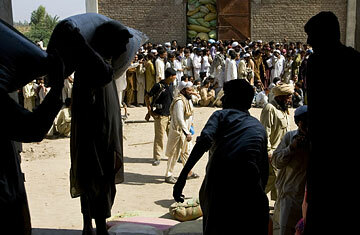 Under a blistering sun, the tribesmen queue impatiently for attention. Sweat drips from their head as they attempt to edge closer to the doors of the refugee registration center in Dera Ismail Khan, on the edge of the tribal areas in northwest Pakistan. As time slips by, so does their restraint. Waving angry fists with one hand and clasping their documents with the other, the group of men heaves toward the doors. Police officers on duty scatter the unruly crowd with forceful swings of their long bamboo sticks. Standing at a slight distance, the chaotic scene only makes Fazal Din more nervous. As Pakistani troops advanced into South Waziristan 10 days ago to target the stronghold of Tehrik-i-Taliban Pakistan (TTP), the villager from Karam was fleeing with his family in the opposite direction. After walking for several hours, a bus happened to stop nearby. Parting with whatever cash they had, they bought themselves a ride to this wild and dusty frontier town three days later. "The bombing was hard," Din recalls. "It destroyed five houses near my own." Now, having abandoned his home and possessions, the 30-year-old farmer is filled with uncertainty. As more than 155,000 refugees pour into Dera Ismail Khan, the government seems unprepared for the mounting humanitarian crisis. Diligent aid workers are busy registering the fresh arrivals and distributing sanitation kits. But food aid has yet to arrive. Last week, forms ran out, forcing the NGO-run registration centers to close for three days. There are no plans for camps to be established, even with the fears that the number of refugees could double. Instead, they will have to squeeze into relatives' homes; those without family in the region are renting accommodations at steep prices. As with the Swat refugee crisis earlier this year, the demands of hospitality can be heavy. In a rural suburb of Dera Ismail Khan, Hayat Khan, 55, gives a tour of a cramped, mud-walled two-room home where he brought 10 members of his family to join the 12 who already live there. A deep hole in the ground serves as a makeshift toilet. Barefoot children run around, their hair streaked red and large brown spots on their faces  both signs of severe malnutrition. Dera Ismail Khan traditionally welcoms the Mehsud tribe this time of year, as they vacate their homes in the chilly mountains in favor of the town's warmer plains. But the influx now is seen as fanning the flame of the town's existing ethnic and sectarian tensions. "It changes the dynamic," says Faiysal AliKhan, head of Fida, the main refugee support group in the area. "Dera Ismail Khan is already cash-strapped. There is a shortage of schools and water. There is a lot of crime. Some of the locals are growing resentful. They say that troubles will follow the Mehsuds down from South Waziristan." Already scarred by two years of violence from sectarian bomb attacks and targeted killings, the town is now bracing for fresh attacks as fears rise that militants posing as refugees may creep in. The local Shi'ite community, which has suffered vicious suicide bomb attacks, erected new fortifications as the refugees came to town. The garrisoned quarter of the city is sealed off to outsiders. On the streets, where a deceptive calm prevails, soldiers in fatigues plunge through the streets at high speeds, flashing their weaponry. Nearby civilian cars swerve and screech to a halt. The faintest sign of a threat, the drivers fear, may trigger shooting. Helping the security effort in Dera Ismail Khan are some of its most unusual residents: the so-called good Taliban. In a small, nondescript house deep inside the town live the successors of the late militant leader, Abdullah Mehsud. Once the object of the army's fury, the group has since rediscovered favor as the enemy's enemy. Baitullah Mehsud, the Pakistani Taliban leader who was killed in a CIA-operated drone strike in August, had murdered two of their leaders, and they want revenge against his successors. "We are with Pakistan," says Maulana Sher Muhammad Mehsud. "We have told the police about the threat coming to Dera Ismail Khan, with terrorists entering the city. The police are weak in this regard. They do not recognize these people  we have informants there." All around him, young men with long hair and disheveled beards flaunt a range of weapons. During the conversation, a farouche-looking man emerges, carrying a cleaver dripping with fresh blood. "Don't worry," says one of the gunmen, with a broad and satisfied grin. "They are only slaughtering a lamb, not men." In an attempt to ease its task in South Waziristan, the army has sought to isolate what remains of Baitullah Mehsud's network by striking arrangements with such unsavory groups. Most notably, it has revived non-aggression pacts with two powerful militant leaders from the rival Wazir tribe. As the army advances toward the Baitullah Mehsud network's strongholds from three different directions, Mullah Nazir in western South Waziristan and Hafiz Gul Bahadur in North Waziristan are facilitating its movements. Troublingly for U.S. troops in Afghanistan, both groups still mount cross-border attacks there. To the east, Turkistan Bhittani, a militant leader who has mustered a small militia to fight alongside Pakistan's army, is leading it into South Waziristan through his tribe's traditional territory. So far, the Mehsuds have sat out the fight. "Our tribe is against these militants, but they are all afraid," says Maulana Banat Khan Mehsud, another elder of the Abdullah Mehsud group. That fear also pervades the refugee registration centers, where few are willing to openly denounce the Taliban's brutality. Instead, there are fierce criticisms of the army's earlier operations, the ruinous peace deals that it left behind and its role in the creation of these factions. "I don't like Baitullah Mehsud at all. He caused all this to happen in the first place," says Dilawar Khan, 50, a teacher from Kotkai village. "But who made these Taliban? It was the army." Perhaps only by finally ridding their mountains of the Taliban will those hearts and minds be won back. As the army slowly pushes deeper in the face of stiff resistance, there are signs of stronger resolve. But victory remains distant  and until then, the refugees' anger will only grow.